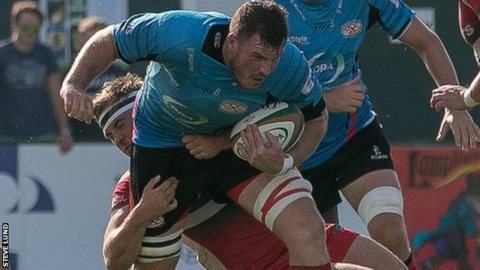 Nottingham made it three wins in a row with a narrow victory over Jersey. The islanders were in front at half-time after tries from Nick Haining and Tom Howe, with Paul Grant and Billy Robinson going over at the other end. Toby Freeman and Ben Morris tries then put Nottingham in control but Jersey's Nick Campbell touched down to set up an exciting conclusion. Rich Lane went close to a late winner for the hosts but was stopped just short of the line. The fixture was the first Championship game to be staged on a Friday night at St Peter, breaking from the traditional Saturday afternoon slot. Grant's try in the first ten minutes, from a catch and drive line-out move, put the Green and Whites ahead but Jersey hit back in similar fashion with back-row Haining crashing over. The Channel Islanders had beaten Nottingham the last four times that the sides have met, and home supporters would have been hopeful of another Jersey win when winger Howe darted through after a well-worked short line-out to help the score to 17-5. The gap was reduced to just two points by half-time though, following Robinson's try. The full-back gathered the bouncing ball well to touch down after centre Heath Stevens broke through the defensive line. Freeman went over for Nottingham's third after a messy line-out and then Morris spotted another gap in the Jersey defence to dive over the whitewash and ensure the bonus-point for the visitors. Lock Campbell grabbed Jersey's third try as he was driven over the line at the maul. But, the islanders momentum was halted as winger Ross Adair was shown yellow when referee Ian Tempest adjudged he had taken scrum-half Darryl Veenendaal out in the air. Former Bath full-back Lane looked like he might still give Jersey the win and maximum points with time ticking away but he was tackled just short of the try line, after a good break from Howe, and the chance went begging. Nottingham move into the top half of the Championship table with the win, while the losing bonus-point means Jersey will probably finish the weekend still in ninth place.